I often experience breast pain. What is this pain? Does the breast pain mean that I am more likely to get breast cancer? Breast pain, which in medical terminology is called mastalgia, is one of the most common problems affecting women. Nearly 70% of women experience breast pain at some time in their lives. Mastalgia can occur in one or both breasts or in the underarm area. Many cases of mastalgia are caused by fibrocystic disease (a benign condition) of the breast. There are two common types of breast pain: cyclical and non-cyclical. Cyclical breast pain, which accounts for almost 70% of all breast pain in women, is associated with levels of the hormones, estrogen and progesterone, in pre-menopausal women. Cyclical breast pain of pre-menopausal women tends to come and go, as the levels of the hormones fluctuate during a woman's menstrual cycle. Non-cyclical breast pain, which is less common, is not hormone-related. In contrast, non-cyclical breast pain typically is associated with some type of trauma (i.e., injury) to the breast. 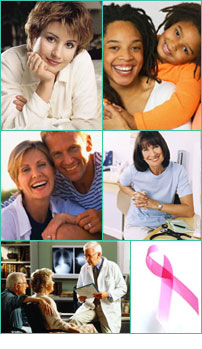 Although breast pain can be distressing and cause discomfort, it rarely is associated with undiagnosed breast cancer. Nevertheless, if you are experiencing breast pain, consult your doctor for a clinical breast examination, diagnosis, and recommendations for managing breast pain. Dietary and lifestyle modifications usually can correct the problem of breast pain. If, however, breast pain persists after these modifications, consult your doctor to discuss treatments (such as hormonal therapy) for breast pain. Does antibiotic use increase breast cancer risk? What does the term, "risk factor" for cancer (including breast cancer), mean? My mother had breast cancer. Does this mean I am at greater risk? I was diagnosed with breast cancer 7 years ago, but I am now in remission. Am I at a higher risk of getting the disease again in the future? Can benign cysts become cancerous? I have no family history of breast cancer. Why should I worry about getting breast cancer? Is there anything I can do to lower my risk of getting breast cancer? Does Hormone Replacement Therapy (HRT) increase my breast cancer risk? What is the Breast Cancer Risk Assessment Tool? What women are at risk for breast cancer? What risk factors are most important in determining my likelihood of getting breast cancer? If I didn�t nurse my children, am I at greater risk of breast cancer? Does exposure to toxins and chemicals in the environment increase one�s risk of breast cancer? Do breast implants increase your risk of breast cancer? Does radiation exposure increase your breast cancer risk? What is the connection between estrogen and breast cancer? I have had fertility treatments. Does this increase my risk of breast cancer? If I take birth control pills, am I at greater risk of getting breast cancer? What are phytoestrogens? Do they cause breast cancer? What are the risk factors that put a woman at a higher risk for breast cancer? What risk factors for breast cancer can you control? What risk factors for breast cancer can you not control? I started menstruating at a very young age. Am I at greater risk of getting breast cancer? If I am overweight, am I at a greater risk of developing breast cancer? I've heard that being overweight before menopause helps lower your risk of breast cancer. Is this true? Is there a link between alcohol and breast cancer? Why does alcohol consumption increase the risk of breast cancer ? Can exercise reduce breast cancer risk? Does a woman's height influence her breast cancer risk? I have never had children. Am I at a greater risk for breast cancer? Why does starting menstruation at an earlier age slightly increase your risk of breast cancer? I began menopause later than average. Does this put me at increased risk for breast cancer? Can I inherit breast cancer from my mother or other women in my family? I have very lumpy breasts. Does this mean I will develop breast cancer or am at high risk? I�ve been told that I have high breast density. What is high breast density? Does this increase my risk of breast cancer? Are women who have fibrocystic changes in their breasts at higher risk for breast cancer? Is there a link between smoking and breast cancer? Does stress increase your risk of breast cancer? Does abortion increase a woman's risk of breast cancer? If I am HIV-positive, can I breastfeed my baby? If I am being treated for AIDS, can I breastfeed my baby? If I take aspirin or ibuprofen regularly, will the medication increase my risk of developing breast cancer? What is the connection between dietary fats and fiber and risk of breast cancer? Can eating soy foods affect the risk of developing breast cancer? Do statin drugs lower the risk of breast cancer? Does estrogen replacement therapy increase my risk of breast cancer? I often experience mastalgia. What causes mastalgia? Does mastalgia mean that I am more likely to get breast cancer? Does using antiperspirants raise the risk of breast cancer? Ever since I was a teenager, one of my breasts is larger than the other breast. Does this affect my risk of breast cancer?